When Cathy reads the referral from the social services in respect of Aimee she is horrified. It says that Aimee kicks, bites, pulls her mother’s hair and has strangled four kittens. The social services are looking for a very experienced foster to take care of Aimee and, with severe reservations, Cathy agrees to look after her. Aimee is angry and she has a right to be. She has been living with her drug-dependent mother in a flat which was described by a social worker as ‘not fit for human habitation’. There was no heating, no hot water, little food, and no furniture. Aimee has been sleeping on an old stained mattress on the floor with her mother. Aimee is so grateful when she snuggles into her bed at Cathy’s house on her first night that it makes Cathy cry. Gradually, with love, firm boundaries and routine, Aimee’s behaviour improves and she starts to learn. But the more Aimee tells Cathy about her life before coming into care the more horrified Cathy becomes. It is clear that Aimee should have been rescued, and removed from home much sooner. None of the professionals now involved in Aimee’s case can understand why she was left to suffer for so long. It seems Aimee was forgotten. "…a heartbreaking story, but does show that childhood experiences of despair and neglect can be turned around….One of the most poignant moments in the book is the conversation Cathy has with Aimee's mother, Susan, where it is clear that she isn't a 'bad' person, but is herself the victim of her past." "This is a wonderful book which helps the reader to wake up to the realities of how the social system fails and works for some children and not others. Truly heartbreaking, but also an awakening to a world I was unfamiliar with." "A new memoir from the bestselling author and foster carer." 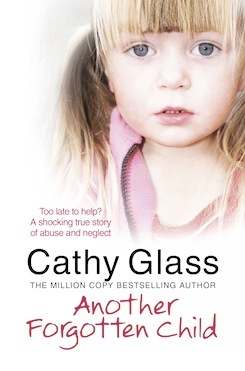 "Another inspiring story from foster carer Cathy Glass." "Absolutely fantastic book just like all her others." "As always with Cathy's books it was well written, a real page turner and very emotional." "This is another Cathy Glass special, if traumatic novel. No spoilers other than to say it is a page-turner, difficult to put down and very readable." "Another brilliant book from Cathy Glass." "A straightforward, full documentation of the challenges encountered in providing care to society’s most neglected children."